In Salt Lake City we have some pretty fancy movie theaters, but they can’t hold a candle to the historical relevance of the El Capitan Theatre on Hollywood Boulevard. The El Capitan, whose doors have been open since 1926, has had legendary stars like Clark Gable perform on its stage. I get a little chill every time I step into the lobby of El Capitan, just knowing that decades before me some of the most beloved performers of all time perhaps once stood in the same place as me. The El Capitan Theatre is located right next door to the Soda Fountain and Studio Store, which is where we began our last morning in Los Angeles. I’ve peeked inside the Soda Fountain and Studio Store before when attending previous events at the El Capitan, but have never stepped inside. Anyone can rent space in one of the party salons at the Soda Fountain for a true red carpet experience. There a few different packages to choose from, and they are perfect for birthdays, bridal showers, work parties, or even just because. We were treated to a beautifully arranged breakfast of fruits and Mickey waffles and had the opportunity to take photos of ourselves on a red carpet. I felt like I’d attended two red carpet parties in the span of three days! 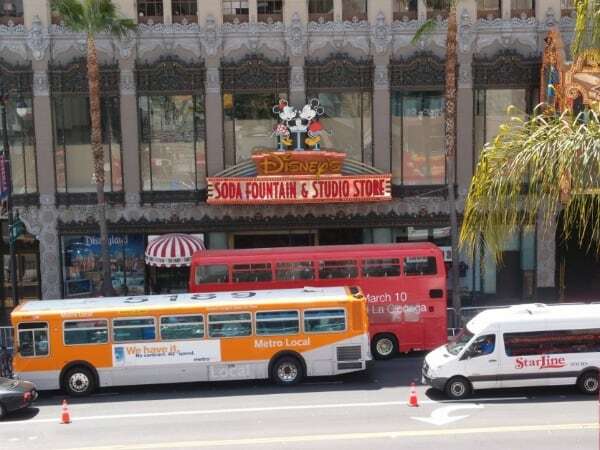 After breakfast, we were taken on a tour of the El Capitan Theatre by Ed Collins, who is the Executive Director of Operations for the El Capitan Theatre and the Soda Fountain and Studio Store. Our tour began in the lobby, then upstairs through a pictorial history of key events for the theatre, and finally into the empty and dim theatre itself. I’ve always loved all sorts of history, but I’m especially drawn to Disney history and Hollywood. 1. The El Capitan Theatre was built in 1926, and for the first fifteen years it only offered stage shows. 2. Rita Hayworth, Bob Hope, and Clark Gable are just a few names you might recognize who performed on the stage at during those early years. 3. No movie theatre dared take on showing Citizen Kane, a movie that was based on William Randolph Hearst, because it showed him in a negative light. Hearst was a newspaper giant, and newspapers reviewed films. Toberman, the owner of the El Capitan, decided to take a chance and so Citizen Kane’s premiere took place there in 1941. Afterwards, the El Capitan was shut down for a year to be remodeled. It reopened in 1942 to show films. 4. For 50 years after the 1942 remodel, the El Capitan (renamed Paramount) showed premieres and first run films. In 1989, Disney acquired the theatre and restored it back to its original look. 5. In June of 1991, the El Capitan showed the premiere of The Rocketeer. Before they showed the film, they opened with a stage show. Today, the El Capitan hosts 10-12 premieres per year. We ended the morning by a little bit of shopping in the Studio Store. It’s like stepping back in time a few decades; there is an ice cream parlor built inside that offers sundaes, cones, and shakes. You can sit right at the counter or even order something street side. The ice cream is made by Dewar’s, which has been around since 1909. I was too full from breakfast to even be tempted by ice cream, but I couldn’t help smiling thinking that the recipe of the ice cream at the Soda Fountain is almost identical to how it was when my grandparents were my same age and living in Los Angeles. I absolutely loved the interior of the Soda Fountain and Studio Store. 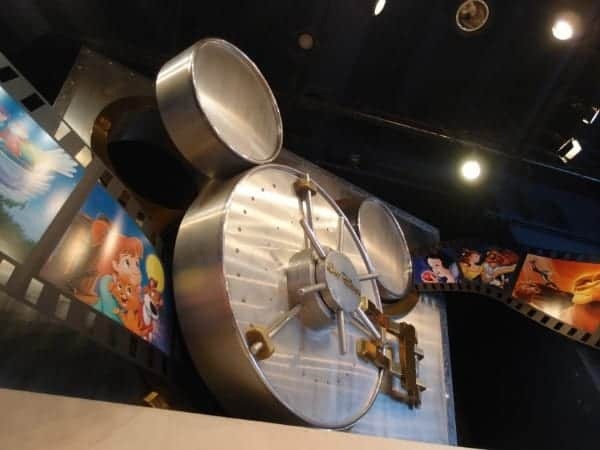 Above the cash register there is the familiar “Disney Vault” that we always see in commercials just as the Blu-rays and DVDs are either coming out again or being put away for another generation. The Studio Store is said to have the largest selection of Disney films, including ones that are hard to find! I saw plenty Disney memorabilia that I would have loved to take home with me, including several figurine. Instead, I treated myself to a comfy gray hoodie with Mickey Mouse on the back! See a Display of Collectibles & Comic Books from the Private Collection of Stan Lee! Sounds like a blast! What a great place for a movie buff, like me, to visit! Thanks for the info! I would LOVE to have a party at the Soda Fountain! It looks like you had so much fun. I’m jealous! It looks like you guys had a ton of fun! I love Disney so especially old Disney stuff is very intersting to me. 🙂 Wish I lived near a place like this! These are fun destinations, I’ll keep them in mind when I’m in the area. That looked like fun. I haven’t been to Los Angeles in years. I wish I could have seen Clark Gable or Bob Hope perform at the El Capitan but seeing Iron Man 3 and then the tour there was equally as awesome. Love the 5 facts about the El Capitan theater. It was such an amazing theater to see Iron Man 3 in. It felt old but had all of the newest high tech sound systems you can think of. That’s a cute picture of you and Sarah! What a great history El Capitan has! Taking on Hearst showing Citizen Kane! Sounds like a good time was had by all! What a gorgeous building exterior! Thank you Disney for keeping it up. Would love to visit someday…sigh! Looks like fun, wish I could still travel and I love the Iron Man movies! wow, that definitely needs to be added to our must-see list. I’d love to see the inside of the El Capitan theater, considering its reputation. It must have been an interesting experience to tour the theater and learn about its incredible history, and imagine all of the amazing events of Hollywood happening right where you were standing. I’d love to know what gong to a premier is like. It seems so crowded full of people that it is utter chaos. Is it, or is it more organized than that underneath it all?